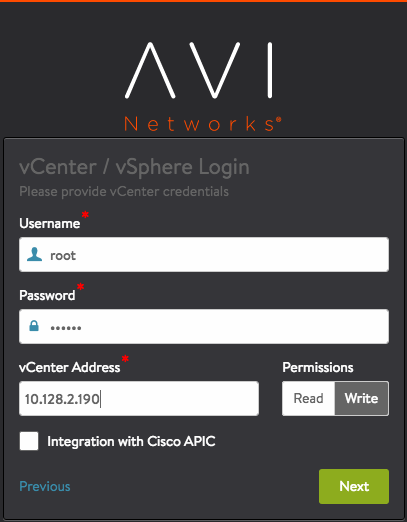 This guide explains how to integrate Avi Vantage into a VMware vCenter cloud. A single Avi Controller cluster supports multiple concurrent vCenter clouds. Avi Vantage is a software-based solution that provides real-time analytics and elastic application delivery services. Avi Vantage optimizes core web functions, including SSL termination and load balancing. Write access is the recommended deployment mode. It is the quickest and easiest way to deploy and offers highest levels of automation between Avi Vantage and vCenter. After completing the deployment process, click here for more information on creating virtual services. Avi Vantage can be deployed with a VMware cloud in either no access, read access, or write access mode. Each mode is associated with different functionality and automation, and also requires different levels of privileges for Avi Controller within VMware vCenter. For complete information, refer to Avi Vantage Interaction with vCenter. The Avi Vantage administrator needs to download only one Service Engine image for each type of image needed (ova/qcow2/docker). The same Service Engine image can be then used to deploy Service Engines in any tenant and cloud configured in the system. For more information, refer to Manually Deploy Service Engines in Non-Default Tenant/Cloud. It is recommended to use the built-in Virtual Service Migration functionality. Avi Vantage runs on virtual machines (VMs) managed by VMware vCenter. 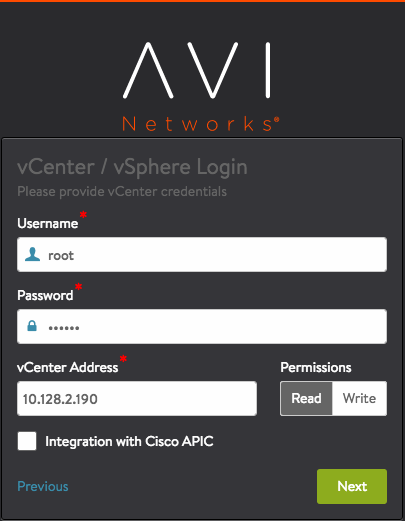 When deployed into a vCenter-managed VMware cloud, Avi Vantage performs as a fully distributed, virtualized system consisting of the Avi Controller and Avi Service Engines each running as a VM. Avi Controller (control plane) The Avi Controller stores and manages all policies related to services and management. Through vCenter, the Avi Controller discovers VMs, data centers, networks, and hosts. Based on this auto-discovered information, virtual services can quickly be added using the web interface. To deploy a virtual service, the Avi Controller automatically selects an ESX server, spins up an Avi SE (described below), and connects it to the correct networks (port groups). Note: Avi Controllers need access to the desired ESXi hosts (over port 443) to allow the Avi Controller-to-vCenter communication. Avi Service Engines (data plane) Each Avi Service Engine runs on its own virtual machine. The Avi SEs provide the application delivery services to end-user traffic, and also collect real-time end-to-end metrics for traffic between end-users and applications. Refer to the Hardware Requirements document for the minimum hardware requirements required to install Avi Controller and Service Engines. Avi Controller can also be deployed as a three-node cluster for redundancy. A separate VM is required for each of the three Avi Controller nodes. However, the requirements for each VM would remain the same. Refer to Overview of Avi Vantage High Availability for more information on High Availability. Ensure that the ESX host has the required physical resources. Service Engine creation will fail in the absence of these resources. CPU socket affinity – Select this option for SEs within their group to allocate vCPU core to the same CPU socket as that of the multi-socket CPU. Dedicated dispatcher CPU – Select this option for SEs within their group to dedicate a single CPU thread to dispatch data flows to other vCPU threads. This is relevant for SEs with three or more CPUs. Disk – Set the disk value to a minimum of (2*RAM_size) + 5 GB to ensure 10GB. For more details on the Service Engine VM requirements, refer to Service Engine Capacity and Limit Settings. Notes: Starting with Avi Vantage releases 17.2.13, 18.1.4, and 18.2.1 Vmware vCenter versions 5.0 and 5.1 are not supported. Starting with Avi Vantage release 18.1.1, VMware vCenter version 6.7 is supported. Starting with Avi Vantage release 17.2.13, 18.1.4, and 18.2.1, the Service Engine VMs have a virtual hardware version 10. The existing Service Engines which are created with virtual hardware versions prior to 10 continues to work. However, new Service Engines are spawned with virtual hardware version 10. 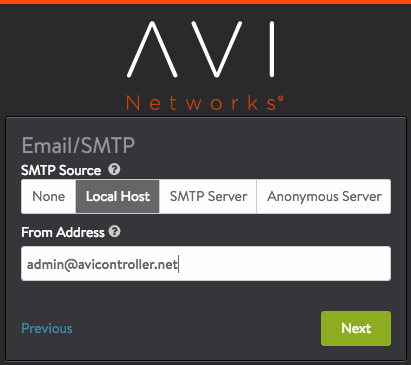 The Avi Controller requires only one management IP address. Administrative commands are configured on the Controller by accessing it using this IP address. The management IP address is also used by the Controller to communicate with other Service Engines. This IP address for all Controllers within a cluster should belong to the same subnet. For more information, refer to the Controller Cluster IP document. Each Avi Service Engine require one management IP address, a virtual service IP address, and an IP address that faces the pool network. 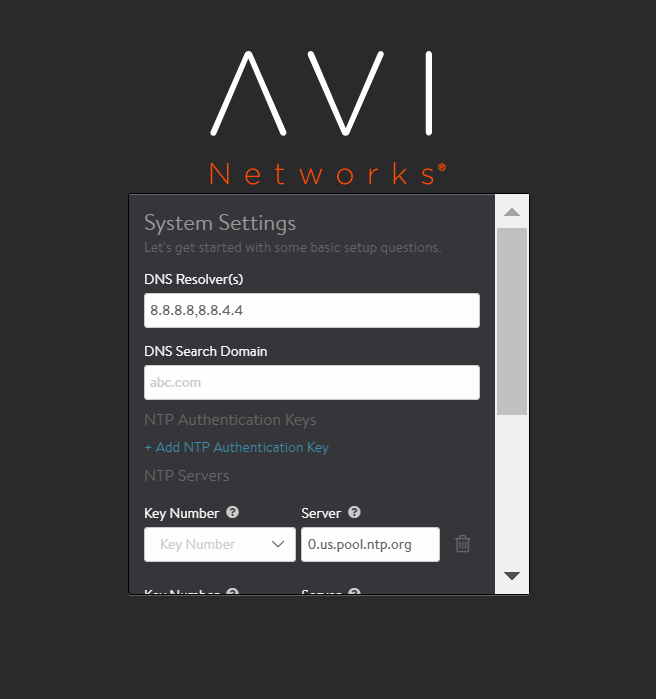 For quick deployments, DHCP is recommended over static assignment for Avi SE management and the pool network IP address allocation. Note: Use a static IP for Avi Controller management address, unless your DHCP server can preserve the assigned IP address permanently. The virtual service IP address is manually specified while creating the load balancing application. You can automate the virtual service IP address allocation by integrating it with an IPAM service. For more information, refer to IPAM and DNS Support. Avi Vantage load balances the traffic with VIP address:port as its destination across the members (servers) within the pool. During the initial Controller setup, a vCenter account must be entered to allow communication between the Controller and the vCenter. The vCenter account must have the privileges to create new folders in the vCenter. This is required for Service Engine creation, which then allows virtual service placement. The required privileges for vCenter are as depicted below. For complete information on VMware user role and privileges, refer to VMware User Role for Avi Vantage. Write access mode – This mode requires a vCenter user account with write privileges. 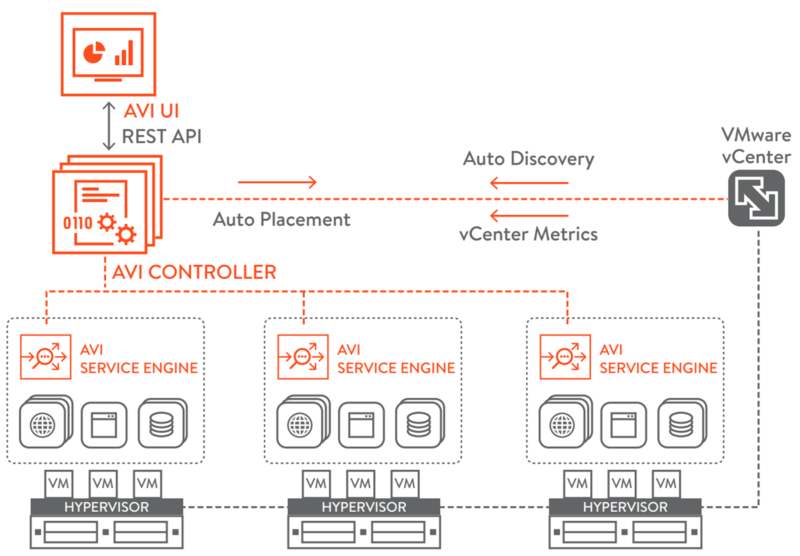 Avi Controller automatically spins up Avi Service Engines as needed, and accesses vCenter to discover information about the networks and VMs. No access mode – Avi Controller does not access vCenter. The Avi Vantage and vCenter administrator manually deploy Avi Service Engines, define networks and interface IP addresses, and map the Service Engines to the correct networks. Note: Starting with release 18.1.2, IPv6 is supported for VMware vCenter in Avi Vantage. Click on File in the top menu and choose Deploy OVF Template. Specify the management IP address and default gateway. In the case of DHCP, leave this field empty. Navigate to the Avi Controller on your browser. Note: While the system is booting up, a blank web page or a 503 status code may appear. Wait for about 5 to 10 minutes and then follow the instructions below for the setup wizard. Set the infrastructure type to VMware. 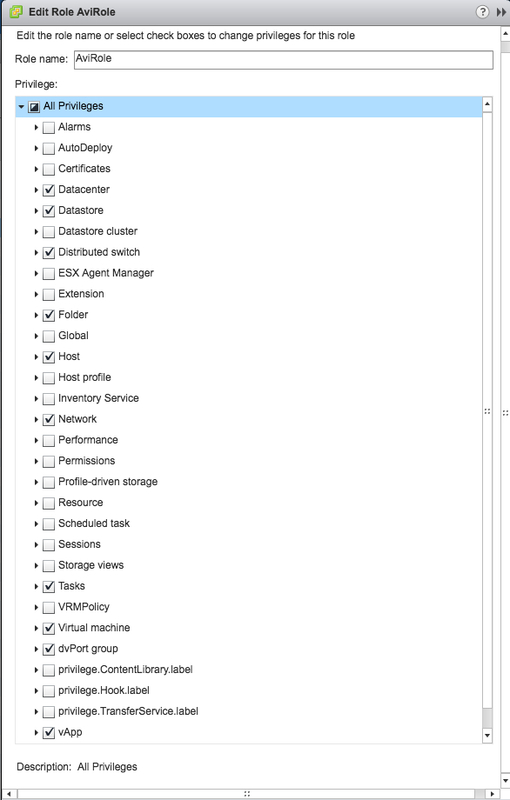 vCenter credentials – To create Service Engines, the vCenter account must have privileges to create new folders in vCenter. Integration with Cisco APIC – Leave unselected or disabled. Data center – Avi Vantage will be deployed here. Configure Avi Service Engine Settings. Support Multiple Tenants – Select No. One vNIC out of the 10 Avi Service Engine vNIC is for management network connection. The other vNICs are data vNICs. For IP allocation method, enter a subnet address and a range of host addresses within the subnet, in the case of static address assignment. Avi Vantage will assign addresses from this range to the Avi Service Engine data interfaces. If the management and pool networks use DHCP, the deployment procedure is complete with this step. In case of static IP address allocation, you need to configure an IP address pool as explained in the next section. Note: This section is applicable only for static IP address allocation. Find a port group and IP subnet on which the DHCP service is not available. Select the port group by clicking on the edit icon. Select Static under Network IP Address Management. Select the IP Subnet by clicking on the edit icon. Enter the static IP address or the range of IP addresses. To verify the installation, navigate to Infrastructure > Clouds and click on Default-Clouds. Click on the Status button. If the status is green, then the installation is a success. The Avi Controller must be able to communicate with vCenter and all ESX hosts that contribute to the deployment. If the communication fails, then the Avi Controller will not be able to spawn Service Engines. Similarly, if the ESX hosts have DNS names, then the Avi Controller must point to the DNS server used by the ESX hosts to avoid the names resolving to different IP addresses. The Controller can discover networks and VMs. The Controller does not automatically deploy Avi Service Engines or connect them to the networks. The Controller can provide the properties of the SE VM analytics. vCenter’s OVF property Controller cluster UUID for Avi Controller must be set for the SEs to connect to the correct Controller cluster. Navigate to Infrastructure > Clouds and click on the key icon, as shown in the screenshot below, to retrieve the Controller cluster UUID. The Controller does not access vCenter and does not automatically deploy Avi SEs or connect them to the networks. The SE deployment and network placement are performed by Avi Vantage and vCenter administrators. The Controller does not provide the VM properties of the SE VM analytics. However, it continues to provide virtual service analytics. vCenter’s OVF property Controller cluster UUID for Avi Controller must be set. Choose a port group for Destination Networks in Network Mapping. This port group will be used by the Avi Controller to communicate with vCenter. 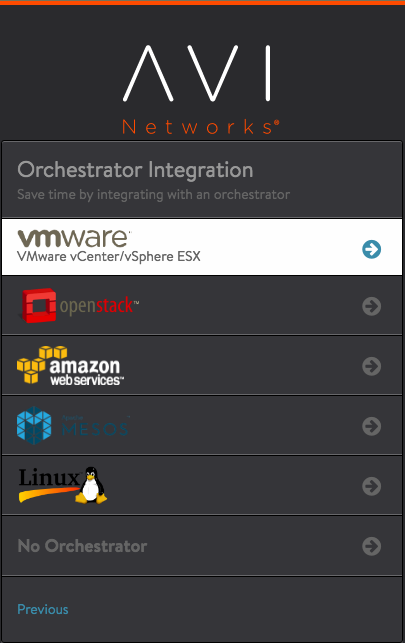 No access mode: Select Orchestrator to end the installation wizard. No more information is required. Read access mode: Select VMware and continue with the rest of the steps. (For read access mode) Enter the vCenter settings. IP allocation method for the networks where the pools and virtual services will be located. To verify vCenter resources discovery by Avi Controller, navigate to Administration > Settings > Infrastructure. The discovery status should be 100% complete. If the management and pool networks use DHCP, then the deployment procedure is complete. If static address allocation is used, then an additional step as explained at Configuring IP address pools for networks is required. Service Engine installation in write access mode is automatic. Download and deploy the Avi Service Engine to install it. The OVA image file for Service Engines is embedded in the Avi Controller image. The Avi SE OVA image can be downloaded using the web interface or the API. Using the web interface – Navigate to Infrastructure > Cloud, click on the button (as shown in the screenshot below) and select se.ova to download the OVA image. Using the API – Navigate to http://avi-ctrl-ip/api/fileservice/seova, where avi-ctrl-ip is the IP address of the Avi Controller. Note: For high availability, use a minimum of two Avi Service Engines for deployment. In vCenter, click on File in the top menu and choose Deploy OVF Template. Choose the port groups for the Avi SE network connections. The Avi SE has ten vNICs. Connect the first vNIC to the management network. 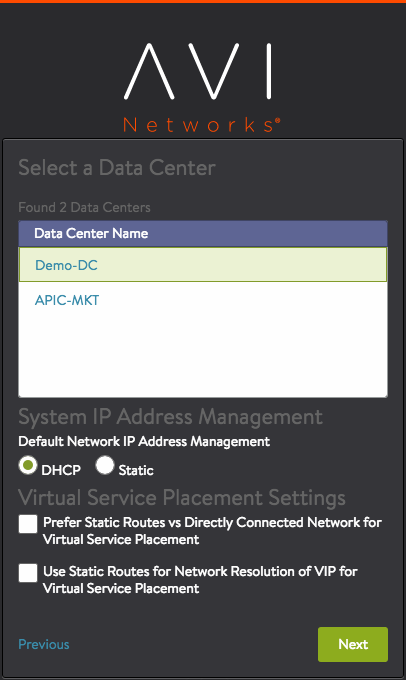 Connect the other vNICs to the data network. For the management connection, choose a port group that will allow the Avi SEs to communicate with the Avi Controller. An Avi SE can be connected to up to nine data networks. Choose a port group in the destination networks for each source network, where you can host the virtual services and pools. 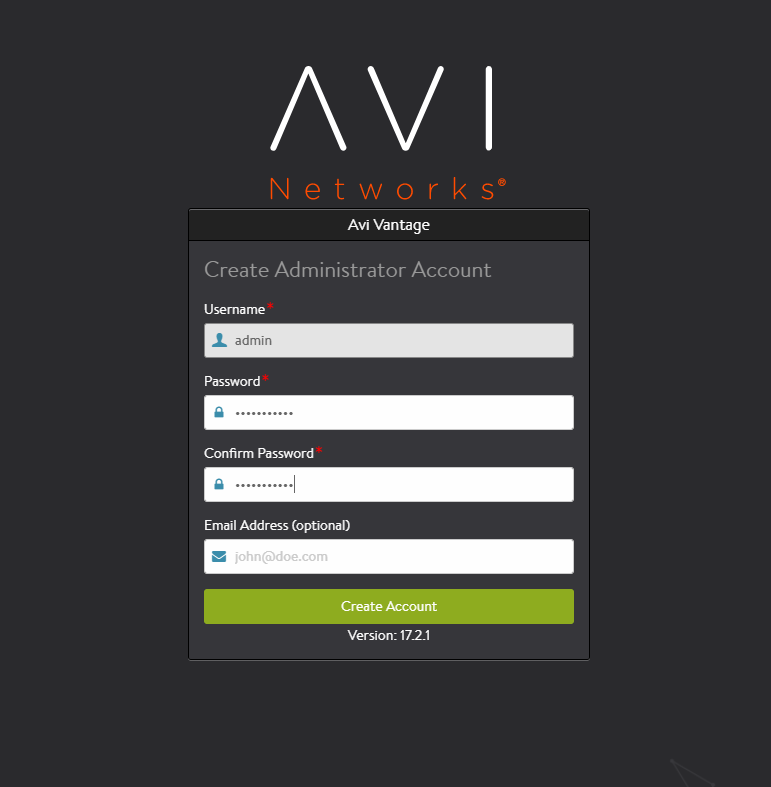 The Avi Controller expects the Avi SE’s data vNICs to be connected to virtual service and pool networks. Click on the key icon to view the authentication token key. Note: In read access mode, the Controller cluster UUID field must be filled in, so that the Service Engine can connect to the correct Controller cluster. In no access mode, the field must be left blank. 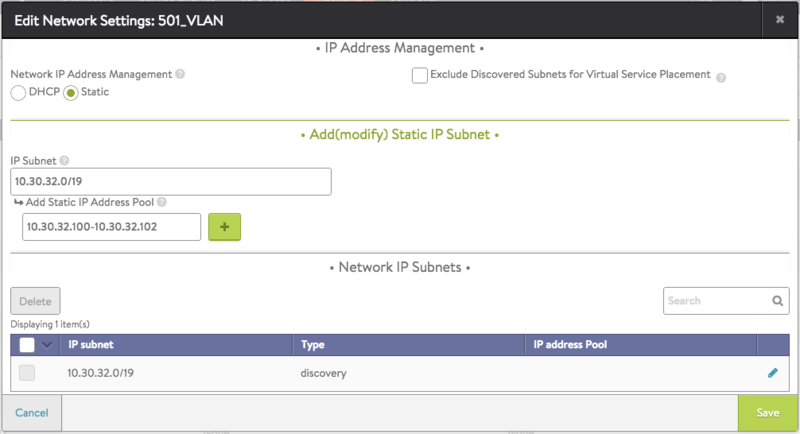 In the VM properties menu, connect the Avi SE data vNICs that are required to reach a virtual service network and pool network to the port groups. Leave the unused vNICs disconnected. This information will be used to identify the Avi SE interfaces, as the Controller does not have access to vCenter and so cannot associate the Avi SE’s interface names with VMware’s interface names. Repeat the above steps for at least one more Service Engine. By default, two Avi SEs are required for deploying a virtual service. Note: This step is applicable only for no access mode. 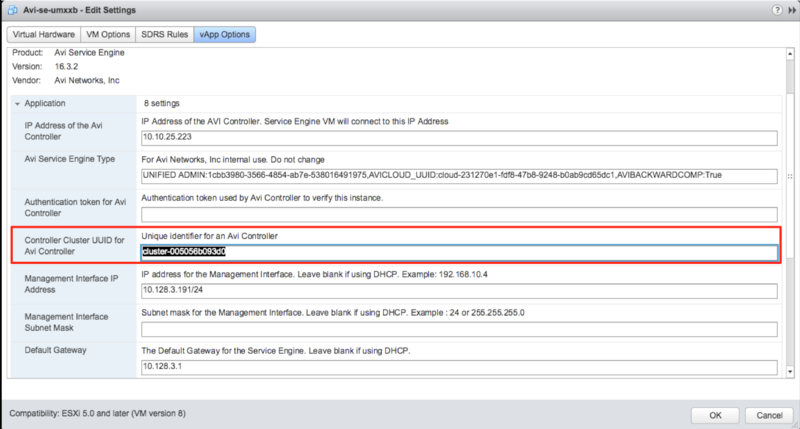 On Avi UI, navigate to Infrastructure > Service Engines, and select the Avi SE that was deployed in the previous section. Find the interface that matches the list of MAC addresses that were noted down during the Avi SE deployment. 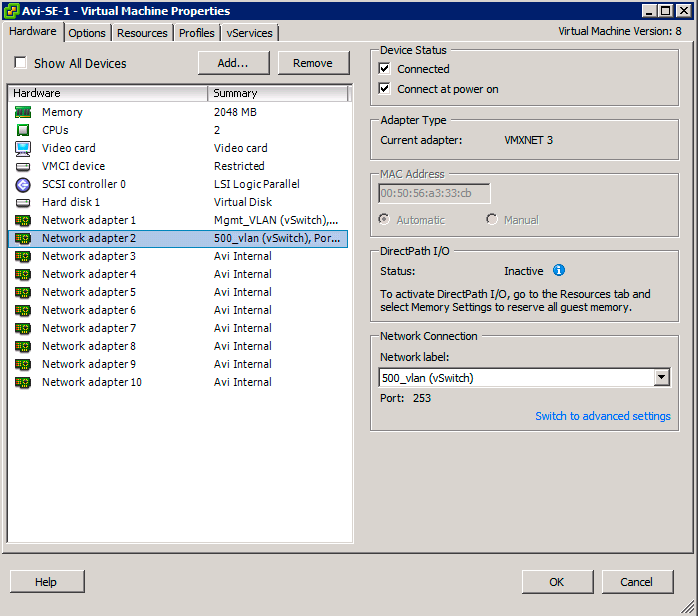 Enable the DHCP option for the interface, if it is available. Otherwise, provide a static IP address as explained in the next section. Repeat the above steps for all connected interfaces of the virtual service and server networks. Starting with Avi Vantage release 18.1.2, IPv6 addressing is supported for Service Engine interfaces. The following screenshot displays an example of configuring the interfaces with both IPv4 and IPv6 addresses. Each Avi SE deployed in a VMware cloud has 10 vNICs. The first vNIC is the management vNIC using which the Avi SE communicates with the Avi Controller. The other vNICs are data vNICs and are used for end-user traffic. 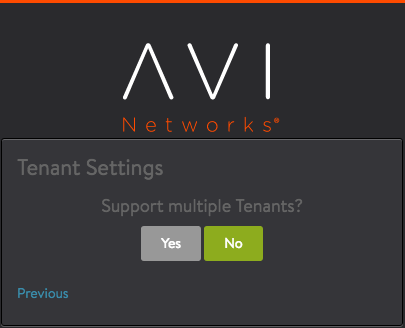 After spinning up an Avi SE, the Avi Controller connects the Avi SE’s management vNIC to the management network specified during initial configuration. 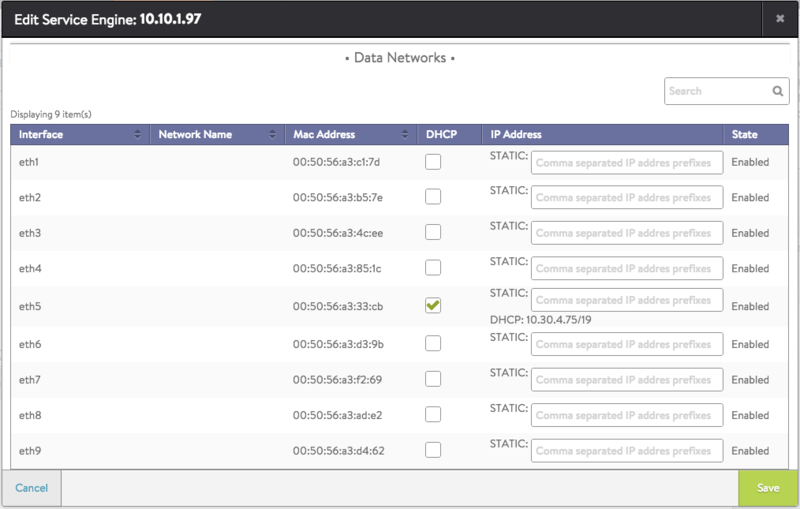 The Avi Controller then connects the data vNICs to virtual service networks according to the IP and pool configuration of the virtual services. 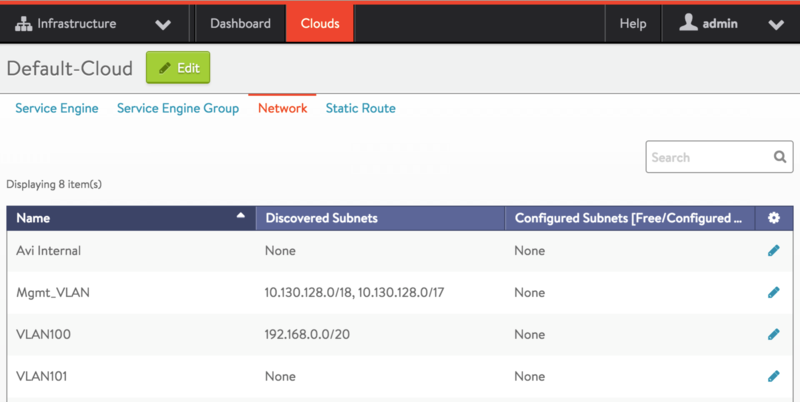 The Avi Controller builds a table that maps port groups to IP subnets. 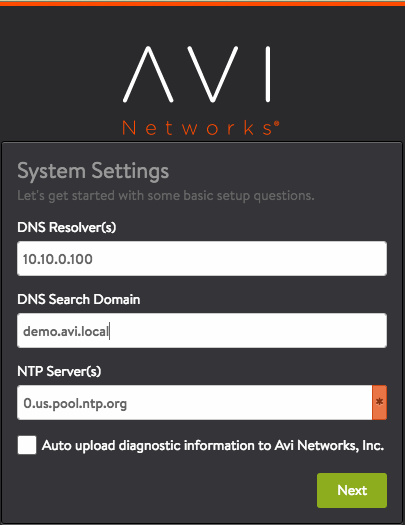 With this table, the Avi Controller connects Avi SE data vNICs to port groups that match virtual service networks and pools.